These days, many of us are weighing the impacts and ethics of meat eating in general. So the prospect of buying and cooking a roast is more daunting than ever. Here's a guide to navigating today's meat markets and making a centerpiece roast worth celebrating. In other words, the source is central, and an organic or grass-fed label alone isn't enough information to go on. 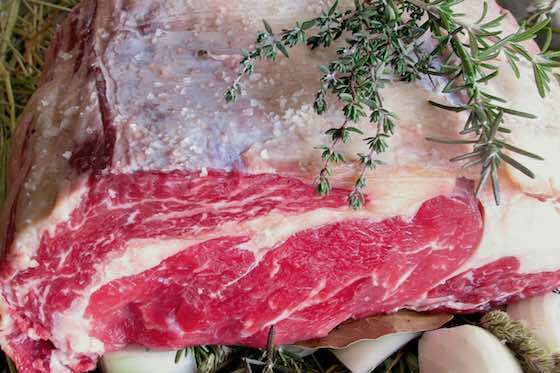 Although some supermarkets curate their meat departments to feature cuts from the most sustainable producers, ranchers in every state sell their beef directly to customers either at the farmers market or online. 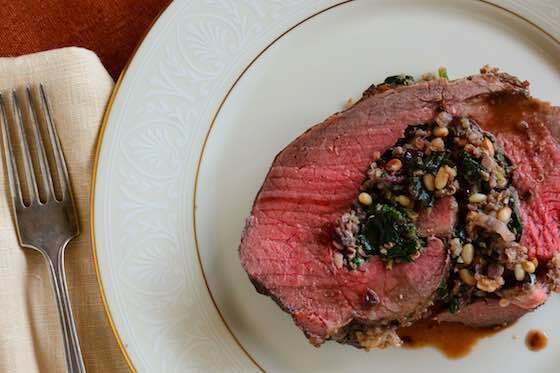 And even if you can't find locally raised beef, some of the most acclaimed producers in the country, such as White Oak Pastures and Alderspring Ranch, can ship a roast straight to you. Of course, you'll spend far more for humanely treated, pasture-raised and well-aged beef. But for a number of reasons -- including concerns about animal welfare, environmental impacts and health -- most experts today agree we should all be buying the best meat and eating less of it in any case. Plan on 4 to 6 ounces of cooked roast beef per person, then load up on side dishes: roasted or pureed vegetables and winter salads not only balance the plate visually and nutritionally but help reduce costs per serving. A stuffed and rolled roast is another strategy that also offers high presentation value. Tenderloin is the old standard, known for its tenderness more than its flavor. But there are many other excellent -- and far less expensive -- cuts, from bone-in rib roast to strip loin, that help support small, independent ranchers who need to sell whole animals, not just a single popular beef cut. This year consider the holiday roast beef from a whole-animal perspective, and you may discover a new favorite. Here's a list of five roasts I recommend, along with general cooking information. There are three essential steps to roast beef: seasoning with salt, cooking to the correct temperature and resting. Generously salting a well-sourced piece of meat 24 to 48 hours before cooking it is the only advance preparation required. Meanwhile, you can concentrate on determining the best roasting temperature for your chosen cut. 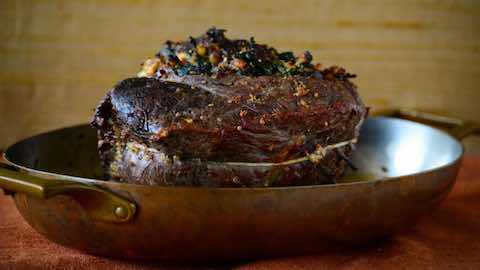 The classic high-heat roasting method -- putting the roast in the oven at 425 F, for example, and then reducing the heat to finish cooking -- is not ideal for less tender cuts like sirloin tip and top round. Slower roasting at 350 F and below ensures more even, controlled cooking for all types of cuts. You might also try my "genius" roast recipes, which use the reverse-sear technique: cooking the roast at a low temperature and then blasting the heat for the last 10 minutes. The rest is actually the final stage of cooking. Factor in an extra 30 minutes and reserve counter space to let the cooked roast sit undisturbed. While you finish preparing the rest of the meal, the meat will reach its final temperature -- often at least 10 degrees higher than when you removed it from the oven -- and the juices will redistribute through the roast. You've heard before that a thermometer is essential for roasting beef. This is because you cannot determine doneness just by sight, as I painfully learned the year I roasted an 8-pound top round to an even gray-brown for my entire family! Temperature tells all. There are handy, inexpensive probe models with alarms, though I depend on the pricey but lightning-quick Thermapen. Bear in mind that thermometers don't think, so you must monitor the roast while you attend to other tasks. Your roast, its shape and size, your oven and a host of other factors determine how long it will take to cook, but the roasting guide below is a good reference. Finally, you don't need any special knife to slice roast beef. Once the roast is well rested, any sharp chef's knife -- so long as it is at least 8 inches long -- will produce even slices of what could be your most beloved roast beef dinner ever. "How To Cook the Perfect Roast"